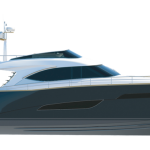 The curvy, unmistakable lines of the Austin Parker 54 Fly S immediately reveal its character: both inside and outside, elegance and sophistication blend with modern, functional design to place this craft beyond fashion and cliché. On the outside, it has a large cockpit served by a roomy bathing platform and the hangar for the tender. The interiors are furnished in a warm, comfortable style, with the mood set by use of orange and brown shades alongside wood, with attractive light-dark combinations that give light and interest to the design schemes. The elegant hard top creates comfortable, roomy accommodation, protected by a glazed screen which separates this area from the cockpit, providing a convenient, rational space. Quality construction and sophisticated solutions are particularly noticeable in the interiors, such as the spacious saloon furnished with leather sofas, given added prestige by the separate galley located just underneath the companion way leading to the cabins; an elegant steel and glass handrail assists access to the galley and the below-deck accommodation. The cabins are elegant, finished in leather and wood. The owner’s cabin has the bed at the side and has its own en-suite bathroom, while the guest cabin has twin beds and a separate bathroom. The layout comprises 3 cabins, 2 bathrooms, crew cabin with bathroom, large saloon and separate galley. The engine room is accessed from the cockpit by means of a large hatch, while the carefully designed layout of the engines and systems allows trouble-free inspection of all parts. The tanks deliver a long range without fuelling stops: 545 litres of freshwater and 2650 litres of fuel. Performance is excellent: cruising speed of 30 knots and top speed of 34 knots with extremely reasonable fuel consumption thanks to the combination of the two 800 or 900 HP MAN engines, the light weight and the optimised lines of the hull.